just1book Photobooks are available in various sizes and orientations. All books come with handmade High-Grade Fabric (inen originating from The Netherlands) covers with a colour range of Black, Grey, Maroon, Midnight Blue, and Beige (Gallery). Turnaround time for a book is 5 working days. Books start with a minimum of 20 pages but additional pages are also available, up to a maximum of 80 pages. Note: We do cater to requests of more than 80 pages. Just create 2 books with our application, notify us, and we will stitch them together for you. just1book offers three book ranges to enable you to find the perfect book for each of your works. We will also throw in a 20% discount on the second, third or more of the same book ordered! Isn't this another perfect reason to print with just1book ? Design a stylish and professional Photo Book to preserve your memories. High-quality Photo Book! Fast delivery in Singapore! 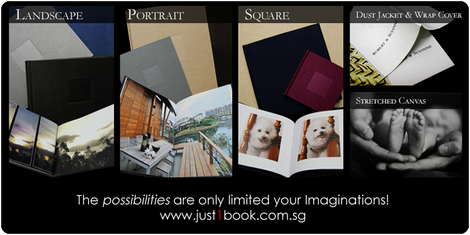 $0 for 40-page Mini Square Softcover Photobook from Photobook Singapore (Worth $34). Other Photobook Sizes Available. $5 for 25 pcs of 4R Photo Prints by Photobook Singapore (Worth $10). 50, 100, 200 and 500 pcs Options Available. Online Support Need help? Select your product to find downloads, manuals, answers to frequently asked questions and product specifications. Customized Photo Album or Photography Album from Fotoplay. We are experts in Photo Book Layout Design and Photo Book Promotion Singapore for your special day. "Jaan" is a term of endearment used to address your beloved one. At Photojaanic, we care about helping you treasure and share your memories with our beloved ones. General Specifications: Printing resolution (dpi) 4800 (horizontal)* x 1200 (vertical) * Ink droplets can be placed with a pitch of 1/4800 inch at minimum. General Specifications: Printing resolution (dpi) 4800* (horizontal) x 1200 (vertical) * Ink droplets can be placed with a pitch of 1/4800 inch at minimum. Greeting Cards - We provide customised greeting cards and mugs. Visit our site now for the perfect personalised gifts in Singapore!